(TibetanReview.net, Apr09, 2015) – The top Chinese boss in the Tibet Autonomous Region (TAR) has on Apr 8 vowed to evaluate Buddhist monks and nuns to assess their “patriotism” and to install national flags in monasteries to strengthen ideological control in the region, reported the AFP Apr 8, citing the People’s Daily newspaper. The party will deepen “assessment activities” to ensure “model harmonious monasteries” as well as “patriotic, law-abiding monks and nuns”, Chen was reported to have written in the Communist Party of China mouthpiece Apr 8. Propaganda activities aimed at leading more monks to “educate themselves in patriotism” will also be held, Chen has written. The drive would be aimed at making monks and nuns “feel the warmth and care of the Party and government,” he has added. Chen has said all monasteries must be equipped with “national flags, telephone connections, newspapers and reading rooms,” adding that roads to tie such facilities more closely to other parts of TAR would also be built. Earlier, writing in the influential fortnightly party magazine Qiushi, as reported by Reuters Apr 3, Chen had vowed to make “friends” of Buddhist monks and nuns and to mould their temples and monasteries as propaganda centres of the ruling Communist Party of China. 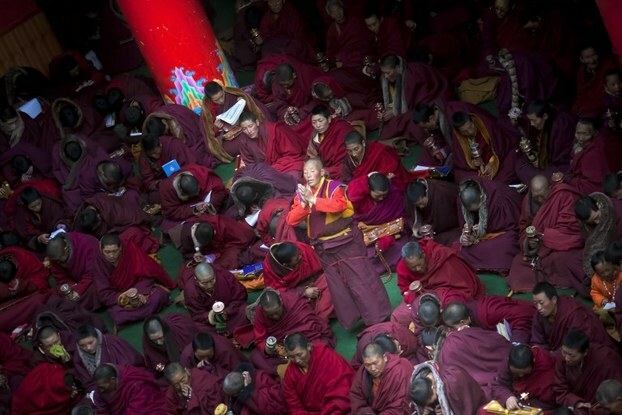 The Reuters report noted that Chen had struck a similar line before, writing in late 2013, that Chinese officials in the TAR must build an “impenetrable defence” against separatism and befriend monks and nuns, who are generally revered by the devoutly Buddhist Tibetans.